The Refurbished Lifefitness recumbent Lifecycle trainer features a wider, more comfortable seat and a semi-recumbent position that enables blood flow to the heart. This new slant on exercise makes stationary cycling easier for every rider. Finally, a means for an effective, motivating and comfortable workout for everyone- a design copied many times by other companies. Ergonomic engineering of the 9500r improves on other recumbent designs by positioning the rider's legs slightly below the waist, eliminating potentially troublesome hip and knee hyperextension; prevents unnatural forward and upward pushing sensation. Position eases gravity's effects on heart rate and blood pressure. With less effort, the rider will work out longer and burn up to 15% more calories on average, while benefiting from excellent development of glutoral and quadricep muscles. 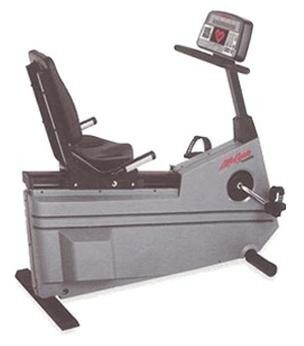 The Lifefitness recumbent Lifecycle trainer features a wider, more comfortable seat and a semi-recumbent position that enables blood flow to the heart. This new slant on exercise makes stationary cycling easier for every rider. Finally, a means for an effective, motivating and comfortable workout for everyone- a design copied many times by other companies. Ergonomic engineering of the 9500r improves on other recumbent designs by positioning the rider's legs slightly below the waist, eliminating potentially troublesome hip and knee hyperextension; prevents unnatural forward and upward pushing sensation. Position eases gravity's effects on heart rate and blood pressure. With less effort, the rider will work out longer and burn up to 15% more calories on average, while benefiting from excellent development of glutoral and quadricep muscles.